Quiet and peaceful location, ideal for families, walking, wildlife and star gazing. 'El Cortijo' is situated in a secluded valley, down a steep track, below the small mountain village of Castaras (800 metres alt), in the Central Alpujarra. The house consists of 2 bedrooms, a double and a twin, both have ample storage facilities. A nicely sized, well equiped Kitchen\Diner is open plan incorporating a Lounge area with 3 seater and 2 seater settees. The Bathroom consists of shower unit, bidet, washbasin and WC. El Cortijo remains cool throughout the day and a gentle breeze can reduce the heat at night. We provide games, an excellent variety of books including walking guides and history of the area. Directly outside the front door is a good sized and shaded patio area with table and chairs and a Gas BBQ, leading from this is a large play area which used to be the 'threshing circle'. The Private Pool is oval shaped, the deep end is less than 6ft and entry and exit is via wide concrete steps in the shallow end. The views from El Cortijo are panoramic looking both down the valley to the Contraviesa and towards the village of Castaras. The owners live in a large Cortijo which partly consists of the ruins of a Mill dating back to 1750. Amongst the 39 acres we grow Almonds, Olives, Figs and are pretty much self sufficient in relation to fruit and vegetables. We keep Chickens and eggs are generally available. There is only one track down to us so there is no passing traffic and we are surrounded by miles and miles of unspoilt countryside. Although we live within the same grounds we respect peoples privacy but should you wish to join us for a glass of local wine we are always glad to share our experiences of the area and to listen to details of your day. The beauty of living here is the seclusion where you can hear birdsong and the stream gently meandering through the valley, at night there is no light pollution making it excellent for star gazing. We are Nigel & Louise and are both retired from working within the public sector in the UK, we live here at the Rambla permanently. We work within the land, harvesting Almonds and Olives, we live completely off grid using hydropower, wind and solar for our energy requirements. Bathroom with shower, handbasin, toilet and bidet. The living room is semi open-plan through to the kitchen, and is furnished with 2 settees, coffee table, and has a wood stove for the cooler winter evenings (an additional charge will be made for fire wood consumed). Kitchen with gas cooker and grill, fridge/freezer, plenty of worktop space, dining table and chairs. Notes on accommodation: The stone built cottage has been recently renovated and extended to a high standard and offers beautiful views down the valley. The accommodation is light and spacious(100sqm), and well insulated. Main lighting runs on solar power (12V), although there is a 220v socket powered by water turbine. A CD stereo player is provided. Internet access is available upon request. Outside: The house is situated on a terrace of almond and fruit trees, with olive trees on the terraces to the rear. Patio doors lead from the kitchen to a paved and shaded patio area. To one side is a traditional stone threshing circle; to the other, the pool and lawn. The oval pool (8x6m) is surrounded by a sun terrace. Sunloungers, outdoor table and chairs and gas barbecue are provided. Cleaning / Towels / Linen / Maid service: All linen, including pool towels, are supplied and will be changed weekly. A laundry and cleaning service can be arranged. The property is in a lovely setting in a valley looking up to the village of Castaras. The property has accommodation for 4, a double room and a twin room. The outside pool is maintained daily and is clean and big enough to swim in. It is a spacious house with plenty of room to cook and relax. We thought the location was fantastic. The property is situated in a remote location but within 10 minutes drive of the main road to Castaras and other villages. The track leading down to the house is steep and bendy but manageable with ease if taken steadily. Nigel and Louise were perfect hosts and were always available to offer advice but never intrusive. All in all we had a great time at this location and would recommend it to others looking for a relaxing break away from the hustle and bustle. Thank you for your kind words, they certainly encourage future guests to visit. 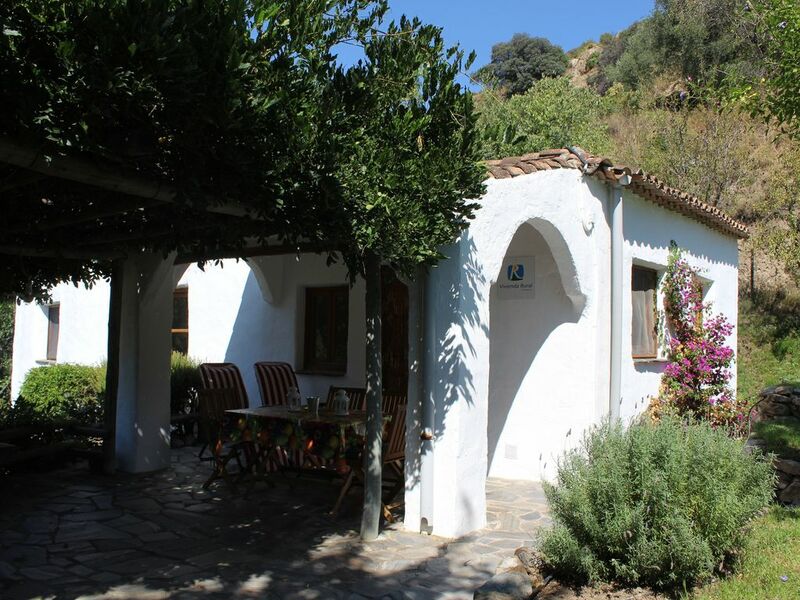 A lovely,spacious cortijo with everything for ease and comfort. It has a very private and attractive garden and a beautiful pool.We had a brilliant 2 weeks with perfect weather and spent our time by the pool,and walking around the high and magical landscape. We only went out to go to the shops for provisions. Evenings we spent making barbeques, drinking lots of the local wine and star gazing. This is exactly how we like to spend our time on holiday.. Our hosts,Nigel and Louise were great. We would see them early in the day, for pool cleaning, and much warm and humourous conversation, after which they entirely respected our privacy. It was really good to have them close by, as it is an isolated place,,so if anything went wrong we could call on them. We had to do this once when we got lost up in the hills and I fell down a steep slope, and my wife put her hand in a wasps nest! We were promptly rescued and told that we weren't allowed out tomorrow! This was all highly entertaining. We also collectively walked up the mountain and watched the lunar eclipse together. That was magic! The location is beautiful, a valley surrounded on all sides by craggy rock and bush with paths climbing through and across the landscape, and really high with views across to Sierra Nevada. Walking up and out from the cortijo is very steep for 15 minutes, after which it gets easier. Driving up or down again is challenging. Not advisable at night! If you like nature,a bit of the wild, peace, beauty and a bit of keep fit activity, this is a perfect place to stay! Thank you for your kind and amusing review. It was an absolute pleasure to meet you and we look forward to seeing you again for the predicted meteor shower next August ! It's like finding a needle in a haystack on the Internet. I was looking for a secluded holiday home in nature in Andalucia, and found the contact of Louise and Nigel. Based on the given descriptions of the location and surroundings and also the reactions of previous holidaymakers, this seemed to be the right choice for me and for my two daughters, also because there is a swimming pool. The journey there was exciting and adventurous and our expectations were fully fulfilled. Be it the very spacious and warmly furnished apartment, the terrace where you could indulge in different times of the day but above all the warmth and hospitality of Louise and Nigel - it was just winning the lottery. The fact that my children could not use WIFI, they could quickly get over it - a good exercise for teenagers. I am particularly fond of nature, be it the variety of insects (butterflies, grasshoppers) or reptiles, so this is the place to go to if you enjoy want to enjoy wildlife. A second visit is at the top of my list, and I can warmly recommend the holiday apartment of Louise and Nigel to anyone seeking solitude and peace in seclusion. I am sure that both want to preserve this resting place as such in the future. Thank you for your review and your kind words. Hopefully we will see you again soon. Wow - all you could wish for and more! Having spent two nights in Granada, we arrived at El Cortijo looking forward to some peace and relaxation - and that’s exactly what we got! We feel really fortunate to have found this wonderful secluded cottage in a really beautiful part of Spain. Off the beaten track and off grid....The cottage itself was spacious and cool inside - just perfect when the afternoon temperatures rose. It was well equipped, with everything we needed for a relaxing stay and Louise and Nigel had even gone the extra mile making sure those often forgotten provisions were available on our arrival. The track to the cottage was steep but provided some spectacular views across the countryside. We visited Cádiar and walked locally, but mainly just sat, ate, drank and watched the wildlife - especially the bats in the evening - just magic! Louise and Nigel are the perfect hosts - always on hand to give advice but never intrusive. We will be back!! Thank you for your kind words, we know that we will see you again soon ! We were delighted to be able to take the property as the odd dates we required ( mid week to week) fitted with our wonderful hosts. We communicated beforehand and they advised us on our route to the property via recommended supermarkets ,filling stations etc. On arriving web were so impressed with the stunning location and to find that the cottage was 'just perfect' for our stay. Over the days we realised what unwinding and relaxing really means . We took full advantage of the pool, solitude and peaceful retreat and enjoyed time with our lovely hosts who were never intrusive but, over the week became warm and generous acquaintances.Our time at El Cortilljo was so very memorable. All was perfect- the cottage well maintained ,clean and easy. The garden simply secluded and the perfect pool to boot. Just brilliant.Thank you Louise and Nigel for a unique stay in your wonderful property. We will recall it in the winter ahead with fondness and envy. Have a well deserved break and ,who knows? ?Roger and Vanessa. Thank you for taking the time to write a review. We are always happy to accommodate our guests on different dates to the 'norm' as we appreciate that costs can vary greatly. We are glad that you enjoyed your stay and we look forward to seeing you again in the future. thanks for a great few days at El Cortijillo, very beautiful mountain scenery. We know quite a large part of Las Alpajurras but it was great to visit so many different villages and towns and sample their tapas and wines. Beautiful cottage and lovely pool and you could not have mad us more welcome. Best wishes to you both, Carol and Malcolm. Thank you for writing, we are glad that you enjoyed your time at El Cortijo. Perhaps we will see you again. The coast is 1.5 hours away at Salobrena/Motril. Granada airport 1 hour 30 mins drive. Malaga and Almeria airports are both 2 hours 30 mins drive. Car hire is available at the airports. Trevelez (highest inhabited village in Europe outside of the Alps) 30 minutes. The mountain village of Castaras is situated in the central Alpujarras, offering access to both the less touristically explored central and eastern villages, as well as the more well known Orgiva area. The village is small, and at present, the only amenities are two bars and pharmacy, although bakers vans pass by daily, and other mobile stores come on a weekly basis. The nearest shops and restaurants are 30 mins drive away. 'El Cortijillo' is situated 10 minutes by car from the village. Part of this distance consists of unmade up track (approx 1500m). The owners live across the stream from 'El Cortijillo'. Booking Notes: A deposit of 10% is required on booking, balance 8 weeks before arrival. Changeover Day: Change over day usually Saturday, but is flexible. Arrive after 4pm, depart 10am (negotiable). We advise that where possible you time your flights so arrival is in daylight to assist orientation. Notes on prices: Prices quoted are for property per week in UK Pounds for 3-4 people. Price for 1-2 people during April / May 2016 = £328.00. Price for 1-2 people June - Oct 2016 = £384.00.